One of my favorite hairstyles is the wavy curl. Rachel Bilson--I love her style too! Separate brushed hair into 2 sections, and work from back to front--that's how I do it. Separate hair how you'd like (some do 3 sections: top and sides) or work front to back. I tend to do what is the quickest for me. This hairstyle takes me about 10 minutes. Lift up the clamp on the curling iron and slide a 1 inch section of hair to the middle of the section. Make sure you are curling away from your face. Let go of the clamp and roll up the iron close to the scalp. Close the clamp and hold a few seconds (5-10, depending on thickness). 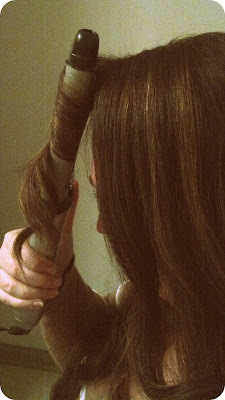 Move down the section of hair by sliding down and rolling up, until you get to the end of your section. Spray hair. Repeat until all hair is curled. 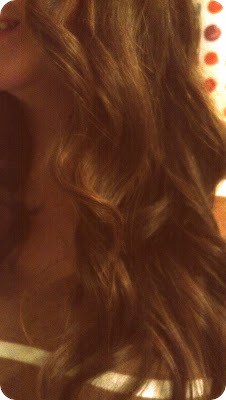 Once hair has cooled, feel free to separate curly waves with fingers. Spray hair all over. You're finished! PS: By starting the curl in the middle of the hair, instead of the end and rolling up, you will get the wavy curly and avoid the ringlet curl. This post is tracker-protected, meaning I can see who plagiarizes this post. Please, do not plagiarize this post. I've got short hair now so I can't actually use this tutorial but I just gotta throw in that you have some amazingly pretty hair! Your hair looks so lovely Elle. I tried this once but for some reason couldn't do it....my friend finished it off for me and she did a wonderful job. Some of us I think....are just not able....:-(. I might try it again after being inspired by your tutorial. Have a brilliant New Year sweetie! and you've been to disney?! how awesome is that! we LOVED expedition everest! that was the very first roller coaster i've EVER ridden and we ended up riding it over five times, hehe. you described my feelings exactly...i'm already ready to go back to disney!! did you get to ride rockin roller coaster when you went? I might have to try this! My hair refuses to stay curly no matter what I do to it. i love to do my hair like this so much, you look gorgeous. I love doing my hair like this too. Yours turned out great! So pretty!! I just wish I had the patience for the curling iron! And I never think of KB when it comes to hair, but you're right, her locks are gorgeous! Good tip on starting the curl in the middle and not at the end. Have you ever tried the no heat curl method with a headband? If you google it on Utube you will see the video how tops. It actually works! So pretty Elle! Love it! the only reason i haven't cut my hair yet is to some of these days wear this cute look you are featuring today Elle! Thanks for the tutorial! I love this look, but I've never known how to do it correctly. Those are some gorgeous waves! I don't know if my hair is long enough to do this, but I'm going to try! I LOVE wavy curls! I wish my hair was long enough to do this! Once again you're ALMOST making me want to grow out my hair. I need my hair to grow a few more inches and then i can do this! you have gorgeous hair lady! to bad i just chopped my hair off!! ; ) and kate beckinsale is such a hottie! love her hair. I'd love to grow my hair out and do this!! Awesome! i really need to get one of those... so useful!! Nice job you look great! looks great! i so wish i had the patience to do something fun with my hair! your hair looks awesome!!!! Love hair tutorials. I'm always looking for new ways to do my hair! & kate beckinsale is totally my hair icon too! She always looks beyond amazing! Love this tutorial! 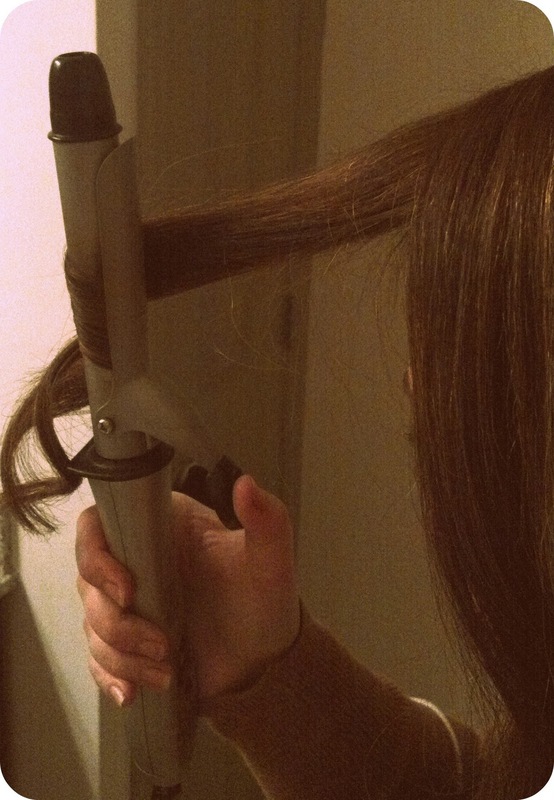 I have that curling iron, so next time I curl my hair, I'll have to try this. i love these!! my favorite. I love this look. I never thought to use a smaller iron for pieces that didnt curl. Great tip. Your hair looks amazing! I'm so glad I read this because I've always started at the bottom and always gotten the stupid ringlet. Thank you! I'll have to try that! Looks awesome! Wish I could get my hair to do anything besides frizz. love this look. great post! Loving the curls Elle! Gorgeous! Kate Beckinsale has the BEST hair. You got your's to look just like her's, very pretty! Great tutorial, thanks. Oh, gorgeous! I am bookmarking this so when my hair is long enough I can do this. You look fab girl! ohh! you are making me miss my long hair!! i cant wait to grow it back :) but cutting it was a great decision, too :) you look so pretty and your hair is awesome! great tutorial! 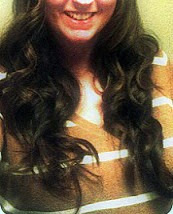 i love wavy curls! Kate Beckinsale is like my inspiration everything! Including that hot husband of hers! Your curls look great!! Beautiful style! I love it! You have such long and beautiful hair Elle. I use a flat iron for mines and it works pretty well too. Thanks for the step by step! the wavy curls are just great on you!! it's such a pretty style. Fun, fun, fun! This is such a good hair look! Kate Beckinsale is totally my hair icon as well. Sigh. Your hair is pretty amazing too - able to hold a curl like that? JEALOUS. I really love this look, but want to try it. You made it look kind of easy. I don't understand what the difference is between a curling iron with and without a clamp though. Why would you want one over the other? This is such a great tutorial -- your waves look AMAZING! Beautiful inspirational looks and even better your hair!! :) Great tip for styling curls!!! Your hair looks amazing! What a fab tutorial. I want long hair so I can do this! Great tutorial! Great tutorial! 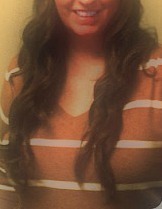 Love wavy hair! ps your hair is so amazing! LOVE your hair like this!! gorgeous! !